Cloud Hopper was my second Goonybird clone that I built by kit bashing an Estes Baby Bertha and as a result has an 18mm motor mount instead of the 13mm that the original Cloud Hopper had. Components used for this build were one Estes Baby Berha Kit (1261) and the plans from http://www.oldrocketplans.com/estes/est0851/est0851.htm. All parts of the Baby Bertha were used except the decals and wood which I swapped for a spare sheet of 4"x3/32" balsa to cut new fins from. After first printing out all the instructions, fin patterns, and decals I started by cutting the BT-60 tube from the Baby Bertha kit to 6" long. I did this because I didn't know the correct length of the BT for the Cloud Hopper but read somewhere that all the original Goonies were approx. 8" long so I'm close. This was the only Con in the construction as I dislike having to cut down tubes this short. Not much room for recovery materials. The next step was the building of the 18mm motor mount. After construction of MM it was glued into the BT and set aside to dry. While it set I went about takeing the fin patterns and traced them on the spare sheet of 3/32" balsa that I had on hand. These were then cut out and sanded and the rest of the build went according to the plans for the Cloud Hopper. Finishing was accomplished in my standard fashion of primming entire rocket with Rust-Oleum 2x White Primmer, letting it dry, sanding and re-primming. This was then followed by two coats of Rust-Oleum Tan and then set up overnight to dry. The following day the decals were trimmed from the sheet of printer paper and attached to the rocket with a glue stick. After allowing glue to set for an hour I then took a small brush and painted in the mouth and wiskers. Once that was dry I glued on the rabbits teeth. After that entire rocket got two coats of Krylon Clear Gloss to seal in decals. Maiden flight wast on 09/08/07 and was another picture perfect flight. Fast straight boost on a B6-4. These or B4-4's are perfect motors for these small flyers. Recovery is handled by the stock parachute included with the kit. And while there is not a lot of room in the BT for it due to the shortness of the tube plus the slightly longer Baby Bertha NC, if it's stuffed with enough dog barf it works OK without singeing the 'chute. Rocket was recovered a ways down range with a broken right stabilizer as a result of hitting the blacktop to hard . Had it landed in the grass it may have been ok as subsiquent flights after repairs have been good and bad. 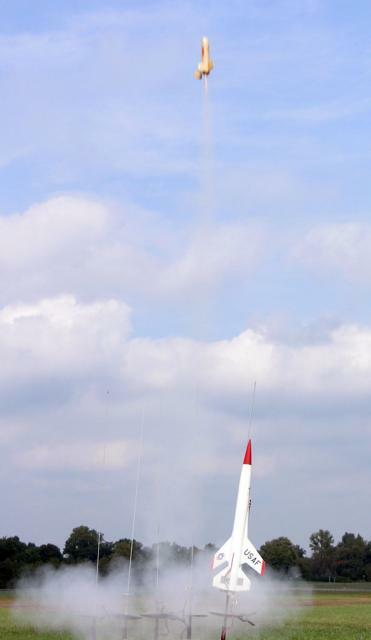 This rocket seems pron to breaking the stabilizer when hitting ground to hard that or my spill hole is to large (2"). As with my first Goonybird, this kit bash was a pretty easy build and I was rewarded with another beautiful flyer. 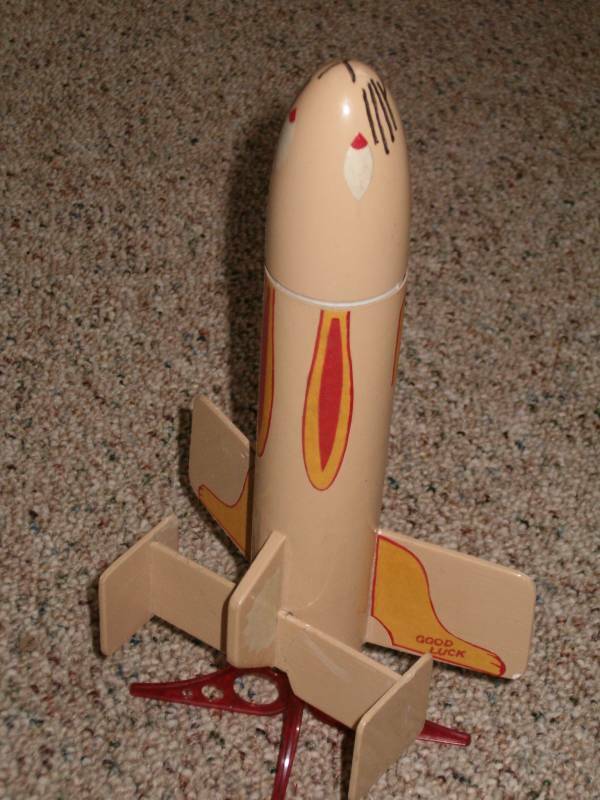 My granddaughter says it's her favorite out of all the rockets I've built so far (80+ when I built this one).